After last week’s info on setting a radius in a wraparound bridge, I had a few people email me asking how they might achieve the same with a Floyd Rose. That makes sense. It's not terribly obvious how to modify a Floyd to accommodate different fingerboard radii. So, I thought it’d be good to chat about that. Sorry. I know it’s only a week ago but, it’s worth recapping in case anyone missed it. Most fingerboards have a radiused surface. They curve across their width. And, for the best playability, the string action should follow this radius. That’s enough of a recap. For more see the Wraparound Bridge Radius Mismatch article. Fill the form below to get yourself some free, downloadable, radius gagues for all this measuring stuff. While there are a number of double-locking trem models the Original Floyd Rose ships with a 10” radius pre-set. Floyd Rose mention on their site that there may already be shims under some saddles to achieve this radius and, if you remove them, you’ll end up with a 16” radius. Personally, I’m not so sure this is always true so please don’t blame me if it turns out not to be the case. However, it does give is a nice segue into the solution to adjusting radius on a Floyd Rose style bridge. By inserting shims under some of the saddles, we can change their individual heights. It’s a bit more fiddly than just adjusting some height screws up and down, but at least it’s possible to do if you’re trying to fit a Floyd to something with a non-matching fingerboard radius. As you’d imagine, adding shims under some saddles — say two each under the 1st and 6th strings, and one each under the 2nd and 5th strings — you can ‘flatten’ the radius (go from a smaller 10” to something larger like a 14” or 16”). Conversely, more shims in under the middle saddles — say two under the 3rd and 4th saddles and one each under the 2nd and 5th will give a tighter radius. Exactly how many shims to get your desired radius depends on the shim thickness so you should expect to experiment a little. Shape for Floyd Rose saddle shims. You can make your own or buy some. So, first up you can easily make saddle shims. Floyd Rose themselves recommend using strips of copper or aluminium tape, cut to size, and stuck to the bottom of the saddles. I’ve also heard tell of players cutting up drinks cans to use for shims (be careful if you do this — that stuff can be sharp). If you’re making shims from any material, remember that you ideally want the shim to extend to the front end of the saddle — that’s right to the open end of the slot for the locking screw. At a minimum, the shim should extend past the intonation/saddle-lock screw. If the shim’s not brought out to here, the saddle can ’tilt’ forward as you tighten down the screw, messing up your height adjustment and making for a poor coupling. If you don’t want to go to that trouble, or if you prefer the idea of steel shims, you can buy some specially made shims that fit underneath the saddles and even have a hole for the saddle lock screw to go through (taking care of that tilting problem). You’ll find shims relatively easily on eBay and — sometimes less easily — on Amazon (both affiliate links but search for ‘Floyd Rose saddle shim’ if you prefer). It’s best done with strings off and, ideally, with the bridge removed from the body. Yeah, I know, sorry. Oh, it might also be worth removing the string clamps from inside each saddle as they have a habit of falling out and getting lost. My advice is to take one saddle at a time. Stick a little bit of masking tape on the saddle next to the one you’re working on and use a marker to indicate the working saddle’s original position. Then you can put it back in roughly the right position after shimming. You’ll really still have to adjust intonation after this work but doing it this way means you’ll be in the ball-park. Mark the rough location of each saddle before removing it. That makes it easier to put it back in the right place. Unscrew the saddle lockdown screw and you can lift the saddle to shim underneath. Make a best guess for shim numbers and lock the saddle back down again. Use a radius gauge to eyeball your adjustments when you’ve got all six saddles done. 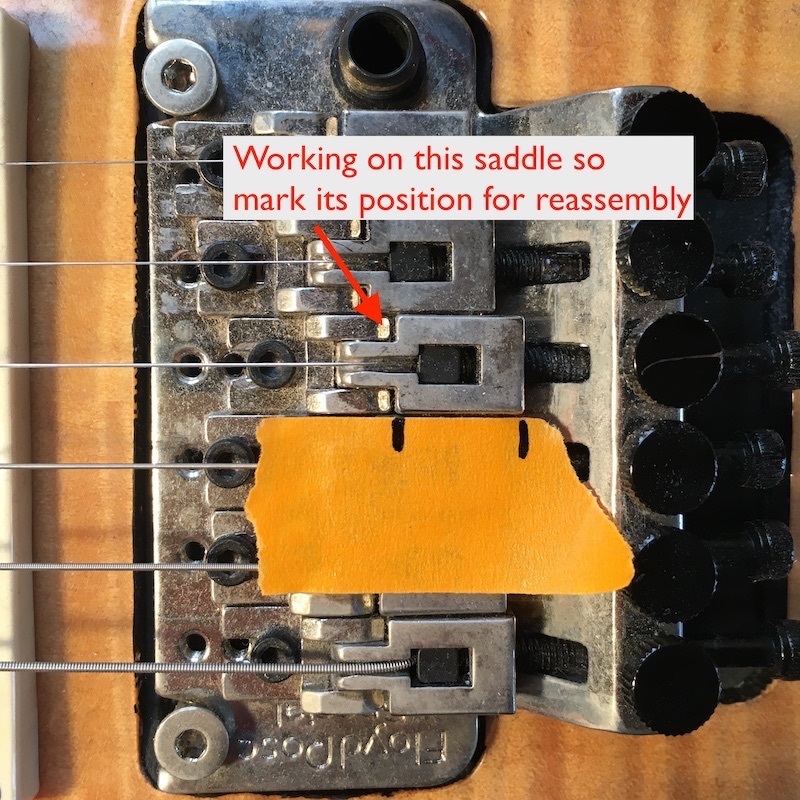 Remember that it’s the centre of each saddle that dictates the strings radius so try line up the gauge to make sure the centre (string exit ramp) of each is following the radius. If it looks right, string up and double check. Be prepared for some tweaking, repetition, and swearing. Once you’ve got your radius correct, adjust the posts to get your overall action where you want it and then follow up by setting intonation. Low, medium, high, high, medium, low. You can still shim these if needed. Also, for some reason, you may find occasional saddles that are completely out of whack with their neighbours. Maybe a shim went missing in the past (or maybe someone made a mistake during factory assembly) but sometimes, one string is weirdly low compared to the others. A shim will usually fix this problem. Nuts are a bit more complicated. As you’d expect there are a number of options for neck width and string spacing. You don’t get a lot of radius options with the nut, though. Essentially, with the nut, unless you’ve a 10” radius fingerboard (or a compound board starting at 10”) you don’t have a lot of choice. There is a 15” and 12” nut but they’re not available in a variety of widths or string spacings. There’s a nut-size chart on Floyd’s site (scroll down) if you need to check. Compromise might be called for at the nut end. Specs are a bit murky for some of this stuff, especially when it comes to licensed bridges. That’s probably not a major problem if you’re reading this just to shim saddles. However, if you’re buying to fit to your guitar, I really advise you do as much due diligence as possible beforehand. Talk to the supplier, maker, or seller and try to assure yourself the hardware will be as close a fit as possible. Older PostWho's to blame for tremolo?